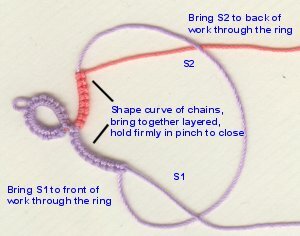 I created this technique for the Online Tatting Class May 2003, published this lesson June 2003 to share. I was invited to teach this technique at Camp Wanna Tat, Montana -- September 2003, and Shuttlebirds Workshop, Spokane, Washington -- April 2004. Published in the IOLI Bulletin under "Thoughts on Tatting" -- April 2004. Notation: HMSR # / i#, first number is first side of split ring and the larger of the two chains, the second number represents the shorter chain and the stitches to be inverted. The stitch count should reflect difference of atleast 2 stitches. Upon completion of this lesson, please try the practice motif provided Clovered Angels. Please view a demonstration and discussion of the use of this technique as applied in a conversion of Martha Ess's Joyce's Angel. This split ring demonstration is a method of creating a bridge emulating the configuration of a "chain over chain". Because of inherent qualities, this method is best suited to front/back, right side/wrong side tatting. It creates an illusion on the front side of the work hiding the thread segments required to complete the half moon split ring on the reverse side of the work. For the purpose of this demonstration a ring of 8 - 8 is the last element of the work. Two colors are used to give contrast. Step 1: Determine your front side of the your work. Step 2: Determine the direction the chains will travel in the line of progression of your work. Example: R 8 - 8, the ring is front side of work. Chain to face away from the base of the ring. Therefore a reverse work would have applied to normally tat the chain. Reverse the work and begin tatting the split ring with the outer layer of chain FIRST using reverse half stitch if applicable in relation to your work and the previous element. Note if the first side is tatted without reverse half stitch, the second will be encapsulated with reverse half stitch. When finished tatting enlarge the core around the hand until comfortable again. 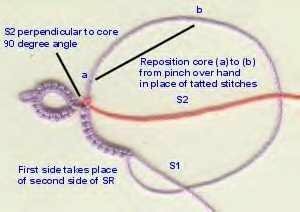 Remove the core from the hand and reposition it so that the tatted double stitches take the place of the second side of the split ring. The previous element is to the left of the core. Always bring the S2 thread under the core and make the first half stitch (reverse half stitch if applicable). 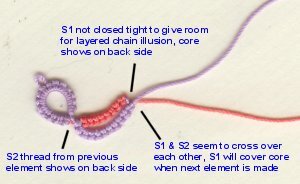 The S2 thread coming from the last element should be perpendicular to the core (90 degree angle)when making the first half stitch. Do not pull tight to the last element. Encapsulate the lark's head knots to created the inner chain. The knots on the completed chains will face the same direction as that stitches tatted on the first side of the split ring but will now look inverted to face the same direction. Snug the stitches to form the natural curve of a chain for both layers. The S1 thread should come out the front of the ring, the S2 thread out the rear of the ring. Bring the two chains, the two sides of the split ring together in a V-shaped horseshoe. Hold the stitches in place firmly while closing the ring to maintain the curve in each chain as the core is drawn closed carefully. Do not close the ring tight or the stitches on the second layer will be too compressed. The core should not completely disappear into the stitches as in a regular split ring but leave the core a measure of height of the inner chain. As you can see the inverted second side has created the illusion of a chain over chain. The S1 thread exiting the split ring to the front will cover the showing core with the transition to the next element. You will also note that the shuttle threads seem to cross over each other as though a shoelace trick had been performed. 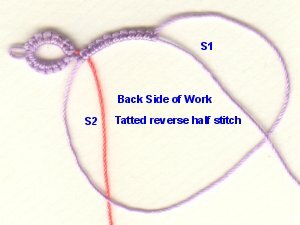 I will emphasize that front/back, right/wrong side tatting is a tatter's prerogative and this technique can be done without the use of reverse half stitch. The positioning of the S1 shuttle thread out the front of the ring and S2 out the back of the work when closing are the key factors in the creating of the illusion and concealing the threads not the use of reverse half stitch. about topics related to this lesson or website.